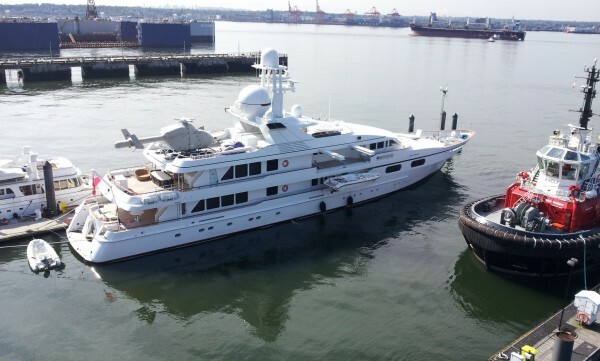 This yacht has the SeaKeeper 1000 ocean monitoring system installed. 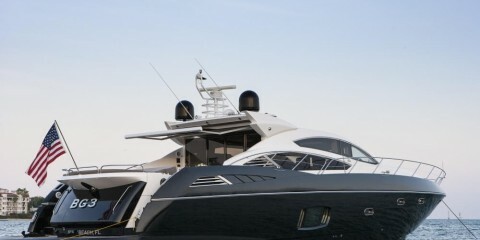 The SK1000 technology provided near real-time oceanographic and meteorological measurements from the yacht’s position to scientific databases. This program ran for over a decade but is no longer operational. 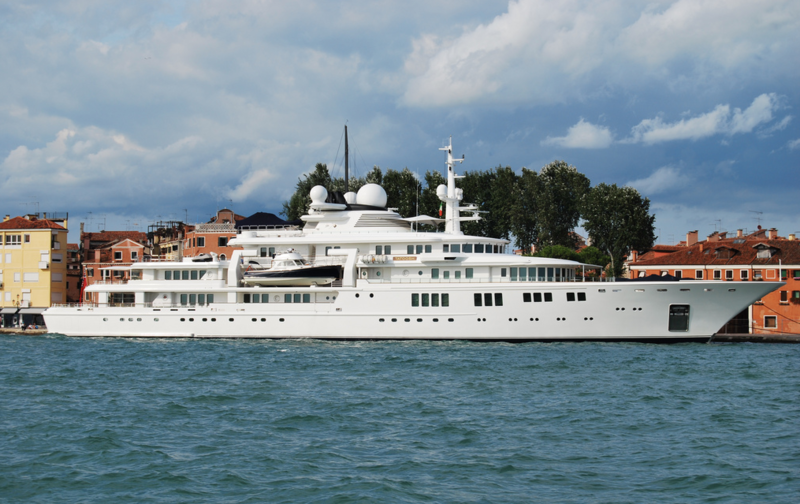 Since these yachts travel all over the world, a frequently visited location was chosen for the position of this vessel. 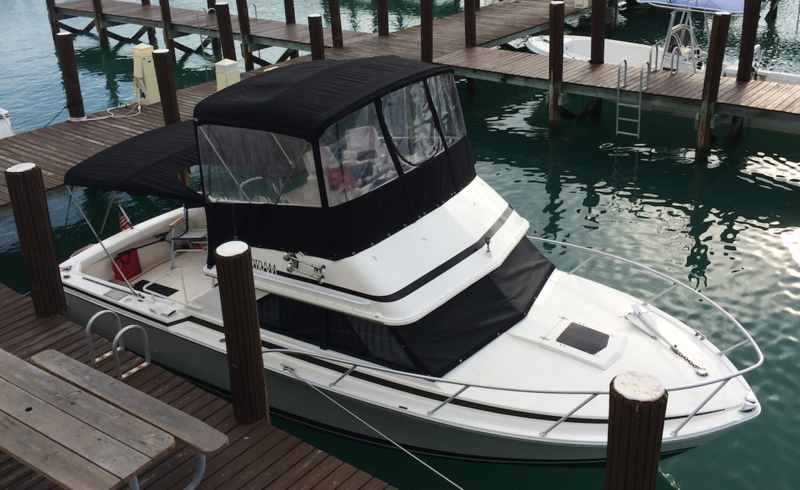 On March 14, 2016 SeaKeepers Singapore 3D was launched with its inaugural educational outreach day onboard D/Y Asean Lady at Raffles Marina, Singapore. 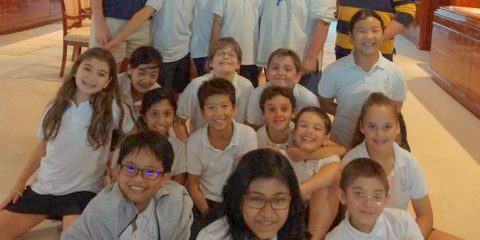 Students from the Singapore American School joined Dr. Ng, a scientist from the National University of Singapore, to learn about coastal development and local marine life. After presentations and an introductory lesson onboard the yacht, participants were provided nets to collect samples from the marina waters. 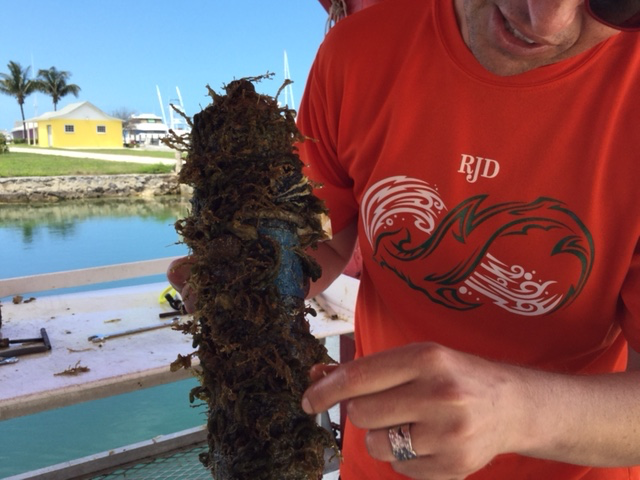 They collected many interesting organisms, including squid, shrimp, fish, snails, soft corals and a flat worm. These animals were brought back onboard to identify and further examine using a microscope. Once the hands-on activities were completed, the animals were released back into the sea. 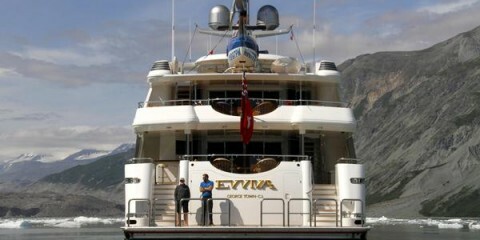 SeaKeepers Board Member Julian Chang concluded the day with a tour of D/Y Asean Lady. 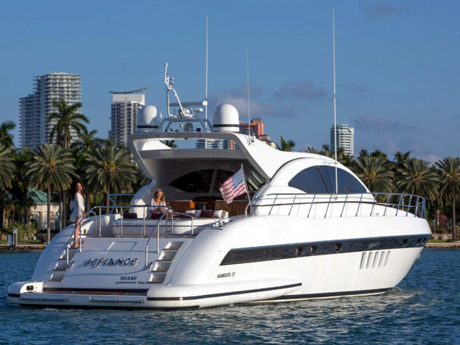 Aboard D/Y BG3, The International SeaKeepers Society supports research, conducted by the University of Miami, on sharks living in and adapting to the urbanized coastal waters of South Florida. 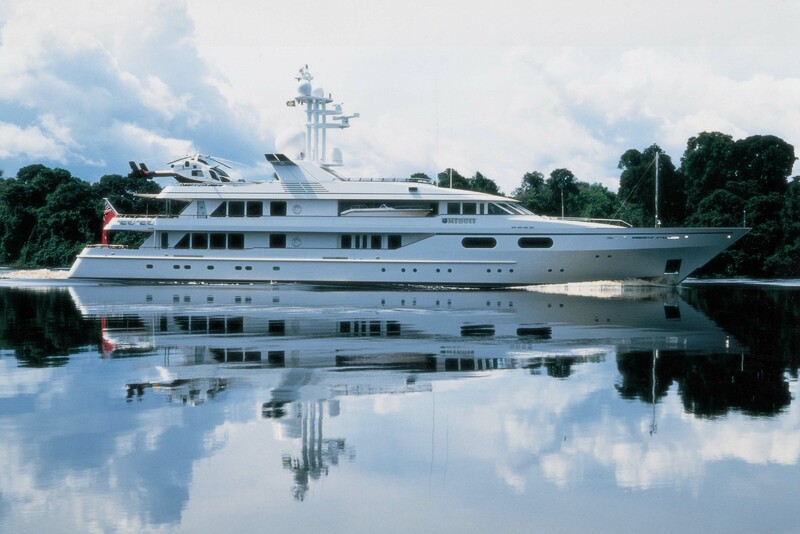 On January 28, 2014 the forty-three meter expedition yacht, Copasetic, made course for the Bahamian island of Bimini with a cutting-edge mobile genome sequencing laboratory placed on the bow. Under the direction of Dr. Leonid Moroz, a world expert in neuroscience and genome sequencing, a team of scientists from UF collected over 1,000 samples of marine life for analysis in the mobile laboratory. Click “more information” to read the story. 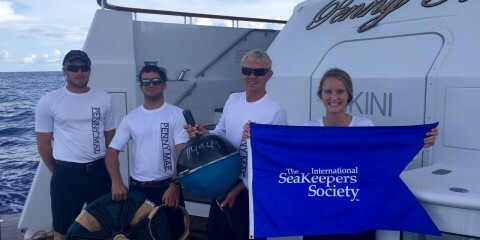 The International SeaKeepers Society hosted an outreach program with Youth Making Ripples Film Festival award-winner onboard DISCOVERY Yacht Defiance. 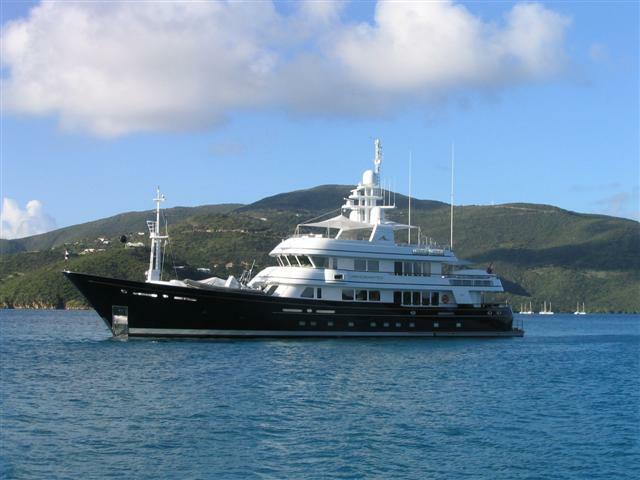 In January 2014 Bahamian school children were introduced to marine science and ocean exploration technology on DISCOVERY Yacht M/Y Defiance. 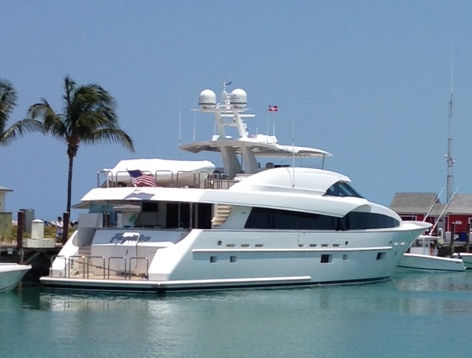 The day included a successful launch of a SeaKeepers Drifter off the coast of the Bahamas. Click “more information” to read more about this outreach event. 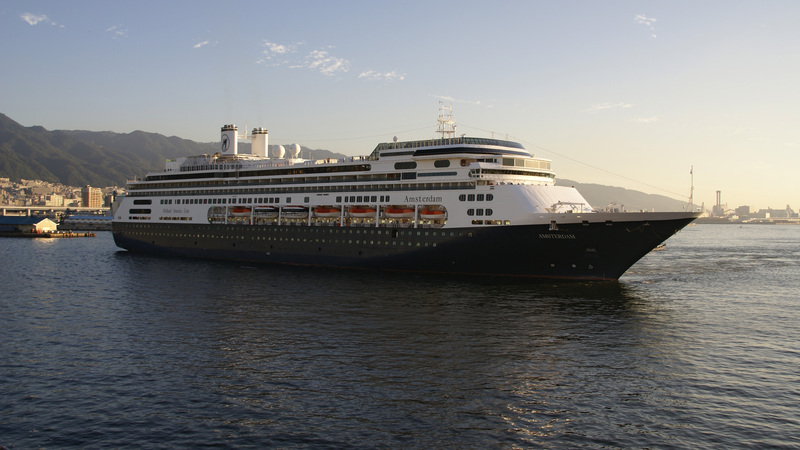 In October 2014 The International SeaKeepers Society teams up with Golden Gate Cetacean Research to conduct research on harbor porpoises in San Francisco, California onboard M/Y E Cruz. 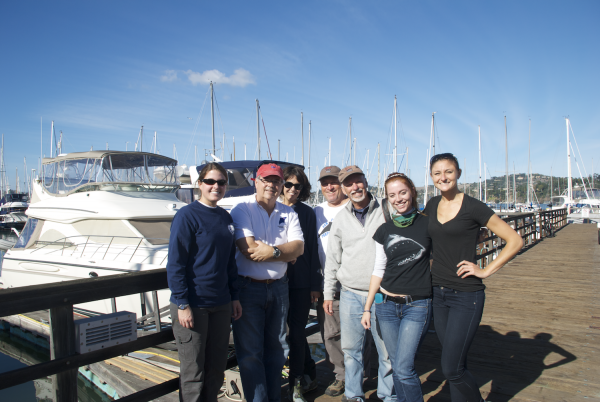 The Golden Gate Cetacean Research (GGCR) team, along with SeaKeepers staff and the owner of E Cruz, successfully studied the behavior and population of harbor porpoises in San Francisco Bay through photo identification. 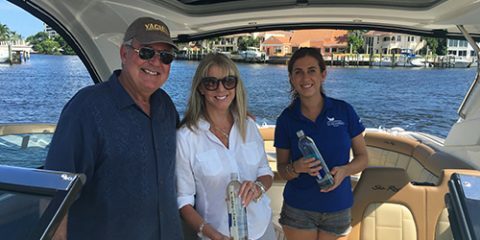 SeaKeepers collected water samples for the ASC Global Microplastics Project aboard D/Y Final Final out of Delray Beach, FL. Water samples were collected from two locations in the Intracoastal waterway. Microplastics—or plastic particles smaller than five millimeters in size–likely pose a massive environmental and human health risk when they enter our waterways. The samples collected will become part of a comprehensive microplastics dataset that will be used to effect change, turning off the inputs of the microplastic pollution at their source. 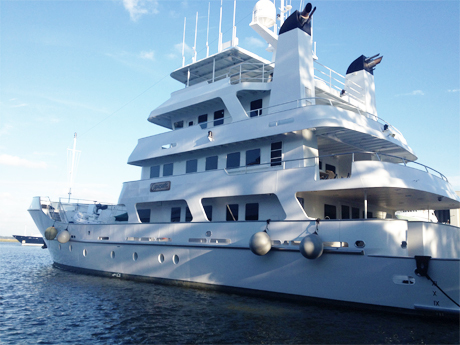 D/Y Fugitive deployed its third SeaKeepers Drifter en route to West End, Bahamas. 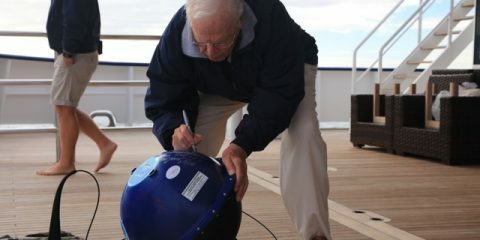 Owners, crew and scientists onboard were all involved in the instrument deployment in the Gulf Stream. 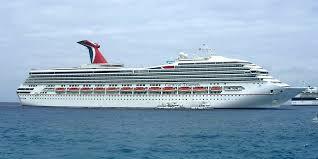 Fugitive deploys its second drifter in the Straits of Florida. Click “more information” to see pictures of the deployment. 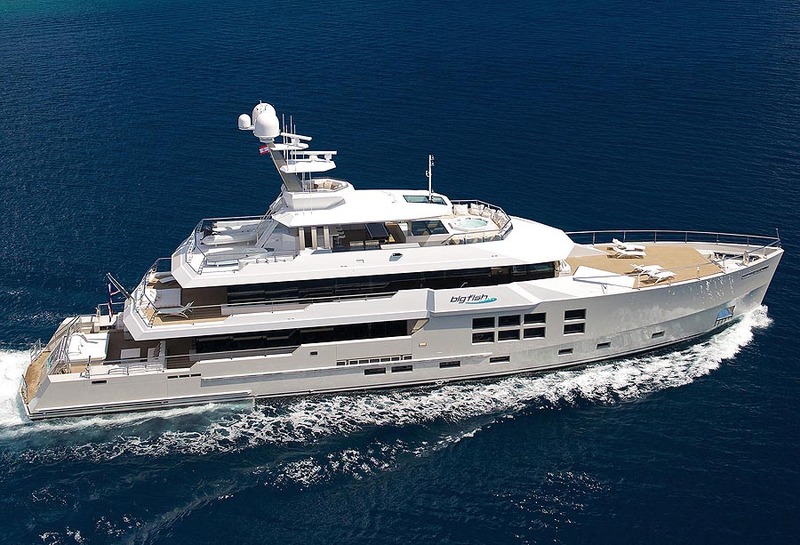 The owners, guests and crew aboard M/Y Fugitive celebrated the yacht’s maiden voyage with a drifter deployment on the eastern side of the Gulf Stream. 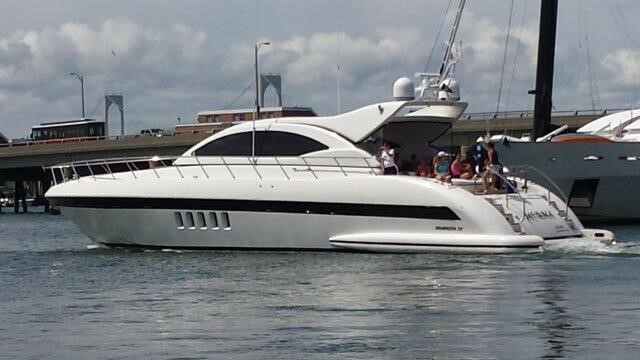 The yacht was traveling from West Palm Beach, FL to West End, Bahamas. Click “more information” to see photos. SeaKeepers teamed up with Global FinPrint, an organization dedicated to assessing shark and ray populations worldwide and understanding the key roles they play in tropical reef ecosystems. With the support of D/Y Fugitive and crew, we worked with two Global FinPrint scientists from the State University of New York at Stony Brook to deploy Baited Remote Underwater Video (BRUV) systems to complete a New Providence Island elasmobranch survey. In total, 25 BRUV’s were deployed, collecting over 2250 minutes of footage, capturing on film a variety of marine life including reef sharks, a tiger shark, a nurse shark, a southern stingray, moray eels, groupers, snappers, and other reef fish. Several sharks observed were notably fouled- they had hooks in their mouths, meaning fishing is present in the area. 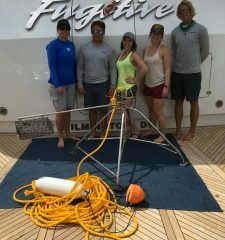 SeaKeepers and the University of Miami Shark Research Center teamed up to retrieve and redeploy hydrophone receivers from Tiger Beach, Bahamas, onboard D/Y Fugitive and its tender, Vigilante. The hydrophones are secured underwater to pick up acoustic signals from tagged sharks swimming in proximity. About once a year, these hydrophones are picked up, cleaned, data downloaded, and then reinstalled. The data retrieved from the hydrophones provide information about shark behavior and migration, which in turn can be used towards protecting these threatened species. 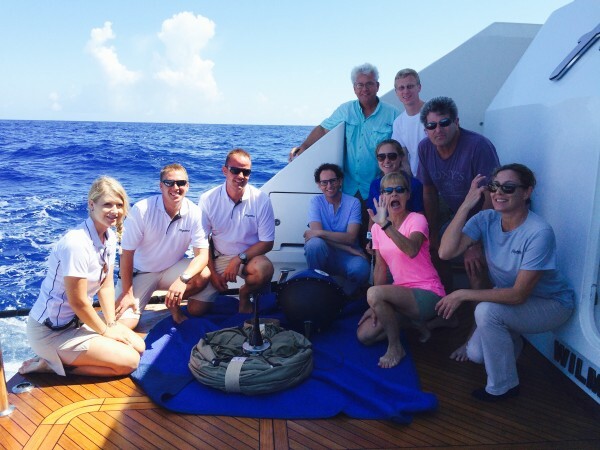 In November 2014, The International SeaKeepers Society returned from a successful shark tagging expedition supporting the UM Rosenstiel School of Marine and Atmospheric Science and RJ Dunlap Marine Conservation Program. 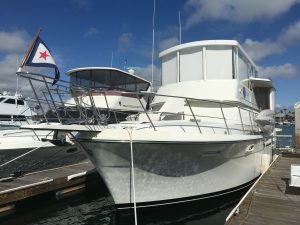 The shark tagging took place at Tiger Beach, Bahamas onboard DISCOVERY Yachts Fugitive, out of West Palm Beach, FL, and Qing, out of Fort Lauderdale, FL. 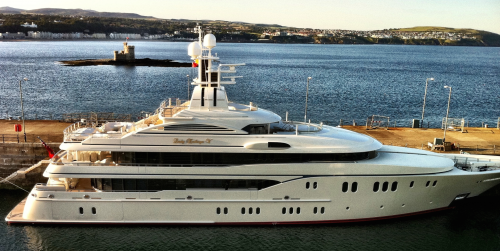 Fugitive is a 125-foot Northcoast and Qing is a 150-foot Cheoy Lee. 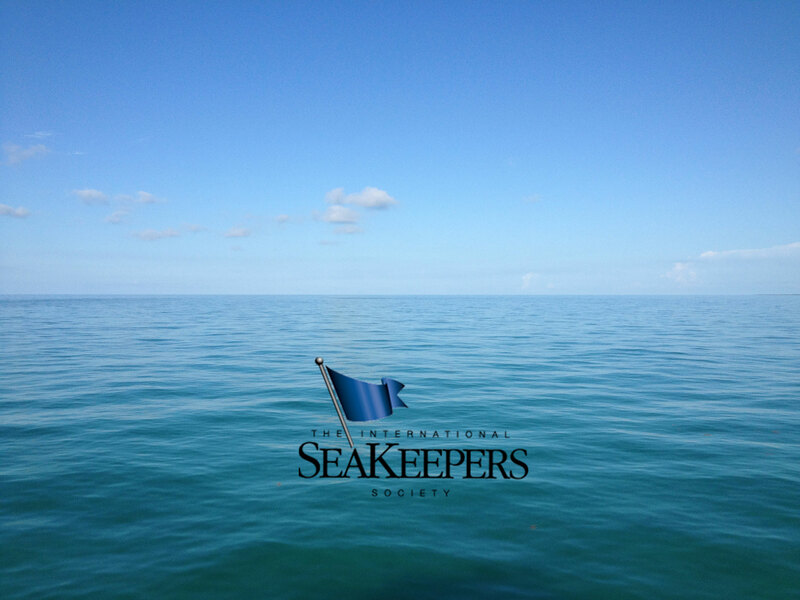 The International SeaKeepers Society partnered with University of Miami researchers from The Consortium for Advanced Research on Transport of Hydrocarbons in the Environment (CARTHE) to study surface ocean transport. The original idea for this project arose when Vizcaya Museum and Gardens approached researchers at CARTHE with an interest in identifying the origin of the large amount of debris they regularly find in their mangroves and along their shore. CARTHE partnered with Vizcaya and the Patricia and Philip Frost Museum of Science to develop the Biscayne Bay Drift Card Study. 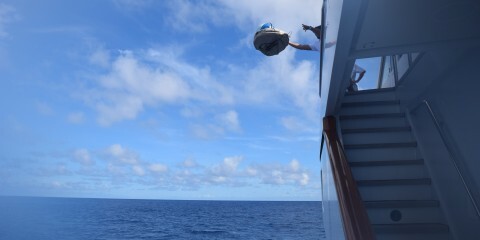 First SeaKeepers Drifter deployed near the Azores! 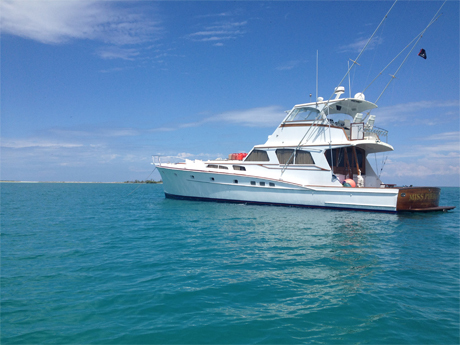 The 28 ft. Bertram Lo Jo served as a support vessel during the shark tagging expedition. 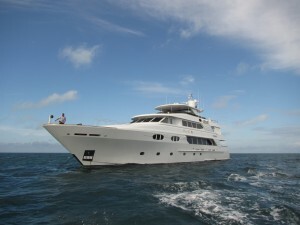 The support staff and film crew used Lo Jo as a dive platform for transportation, filming and hydrophone installation. 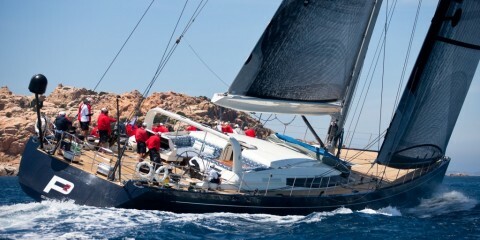 See the DISCOVERY Yacht Penny Mae for more on the expedition. 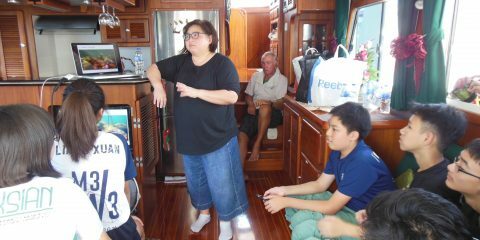 DISCOVERY Yacht members David and Jo Haines hosted students from Deyi Secondary School in Singapore aboard the D /Y Lady Jo as part of an Educational Outreach Program on the 27th of July, initiated by SeaKeepers Asia. 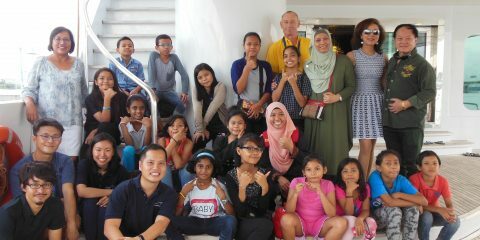 Students from Ang Mo Kio Secondary School in Singapore participated in a DISCOVERY Yacht Educational Outreach Program aboard the D /Y Lady Jo on the 27th of July, initiated by SeaKeepers Asia. 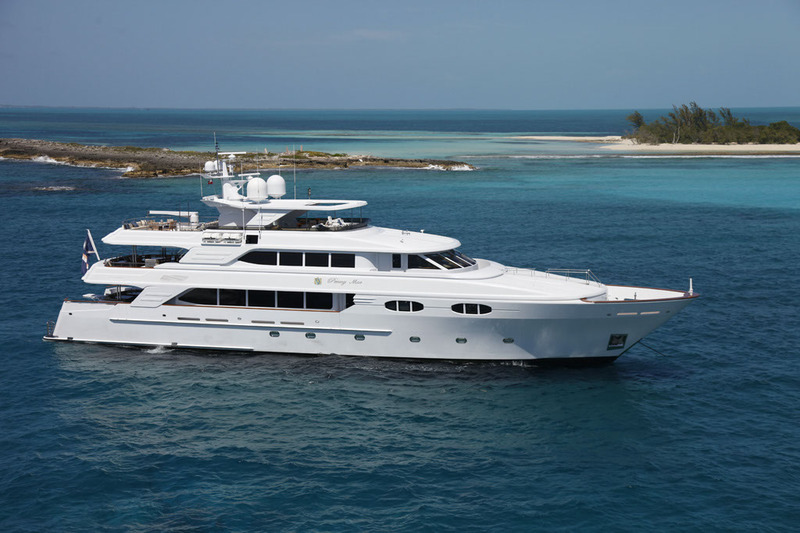 As the first SeaKeepers’ DISCOVERY Yachts mission, this research cruise to the Dry Tortugas provided scientists the opportunity to collect hundreds of coral tissue samples, which were used to study coral genetics and better understand the differences among coral communities. 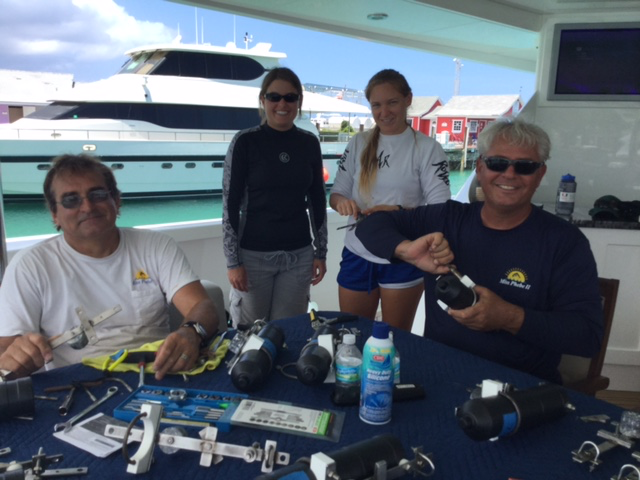 The International SeaKeepers Society completes a weeklong research expedition studying Bahamian sponges with NOVA Southeastern University and WPBT2’s Changing Seas onboard Fleet Miami’s DISCOVERY Yacht Mystique. 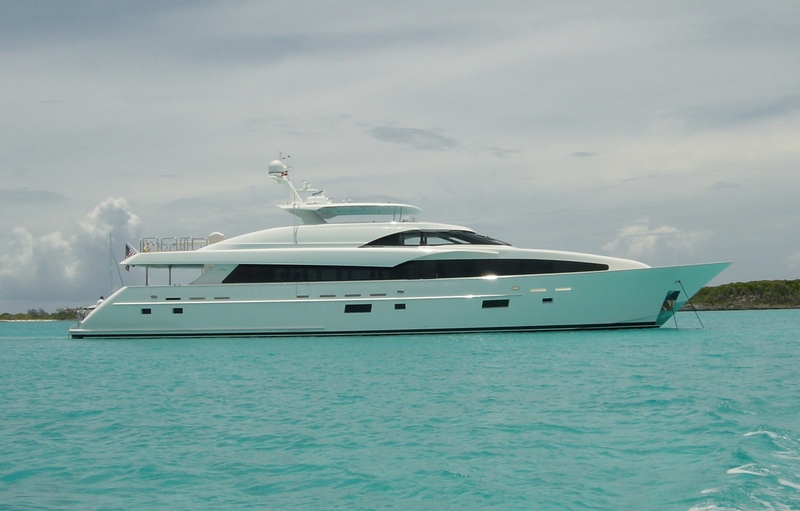 To start off SeaKeepers programming for 2015, EYOS Expeditions onboard M/Y Noble House deployed the first SeaKeepers Drifter of 2015 in French Polynesia. 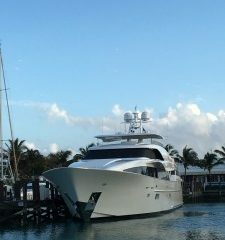 SeaKeepers’ DISCOVERY Yacht Penny Mae hosted researchers from the University of Miami for a five-day tiger shark tagging expedition at Tiger Beach, Bahamas. On May 12, 2014 Penny Mae traveled approximately 30 miles northwest of West End to Tiger Beach, an area where tiger sharks are known to aggregate. Dr. Neil Hammerschlag and his research team, along with SeaKeepers’ staff and the crew of Penny Mae, successfully tagged 13 tiger sharks with the help of a custom-made shark tagging platform designed exclusively for shark research. 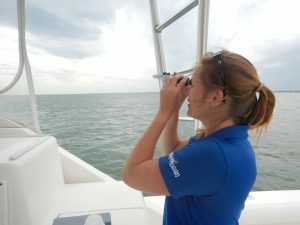 October 2015- The International SeaKeepers Society collaborated with researchers from the University of Florida (UF) aboard the DISCOVERY Yacht Penny Mae as part of a global initiative to survey the biodiversity of the world’s oceans. 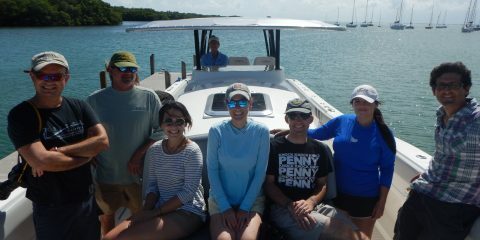 Dr. Leonid Moroz, the principal investigator from UF and a distinguished professor of neuroscience, genetics, biology, and chemistry, led the research team in plankton sampling along a transect from New York to West Palm Beach, FL. 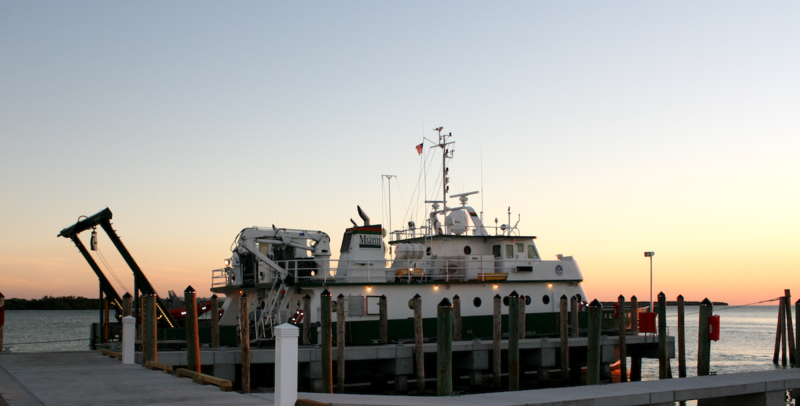 The University of Florida research team, under the lead of Principal Investigator Dr. Leonid Moroz, and by the support of D/Y Penny Mae and crew, have completed the next edition of plankton tows and genome sequencing. 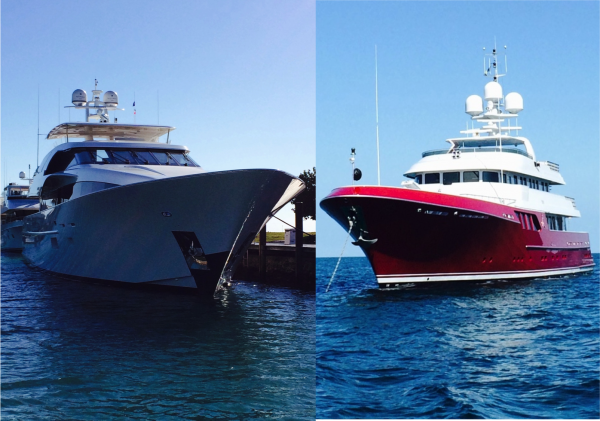 The UF scientists conducted plankton tows en route from Panama to West Palm Beach, Florida over the course of several days. 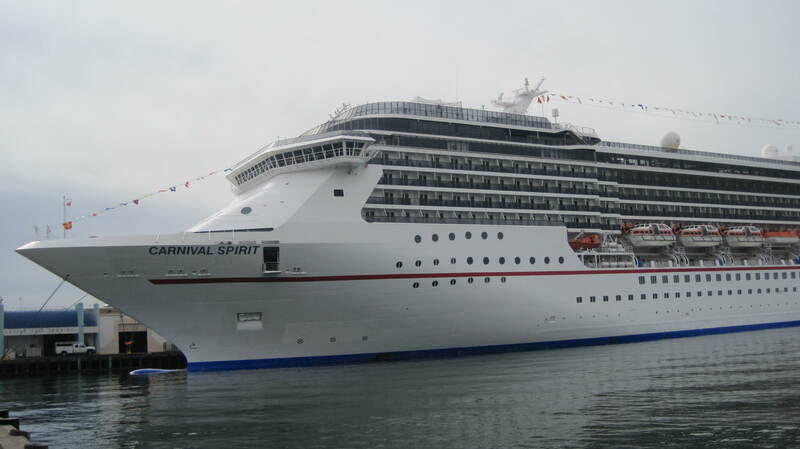 The tiny, planktonic organisms, such as copepods, salps, ctenophores, and juvenile cephalopods that were collected during the cruise, are integral members of marine ecosystems and play a vital role in the health of our oceans. By collecting samples and sequencing planktonic genomics, Dr. Moroz and his team aim to learn more about these critical species by identifying and tracking them to assess their connectivity and dispersal. 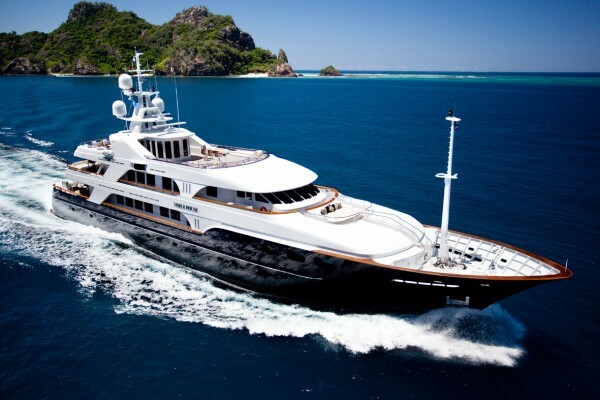 D/Y Penny Mae has been involved in several scientific expeditions with SeaKeepers, including trips for similar genome sequencing research as well as shark research. The International SeaKeepers Society and The Billfish Foundation take first steps in a joint effort to develop new methods for assessing fish health. 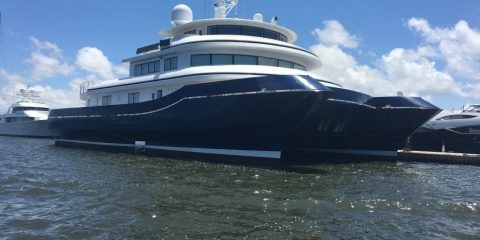 The International SeaKeepers Society spent three days with CARTHE scientists onboard DISCOVERY Yacht Shredder of Fleet Miami. 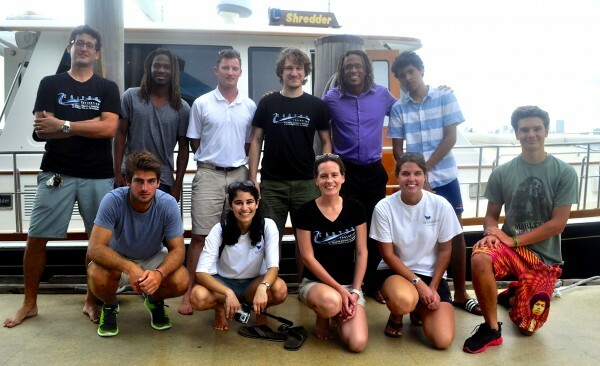 Fleet Miami vessel Shredder participated in a three-day expedition with researchers from the Consortium for Advanced Research on the Transport of Hydrocarbon in the Environment (CARTHE), which included several drifter deployments and an outreach program with the Miami-based nonprofit organization StreetWaves. 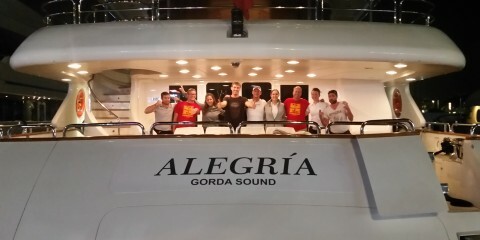 SeaKeepers joined UM Shark Research & Conservation and Save Our Seas Foundation on July 12 & 13 aboard Fleet Miami’s D/Y Shredder for two days of shark tagging. 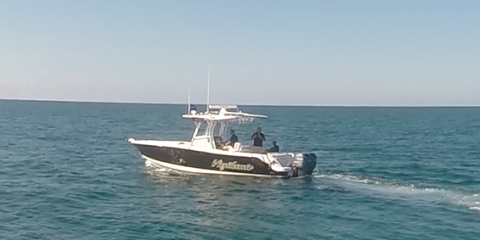 The shark team caught multiple nurse sharks in shallow inshore and deeper offshore waters in North Miami. 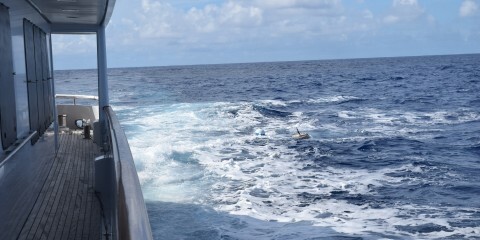 Participants helped to tag the sharks, collect fin clips, and take body measurements. 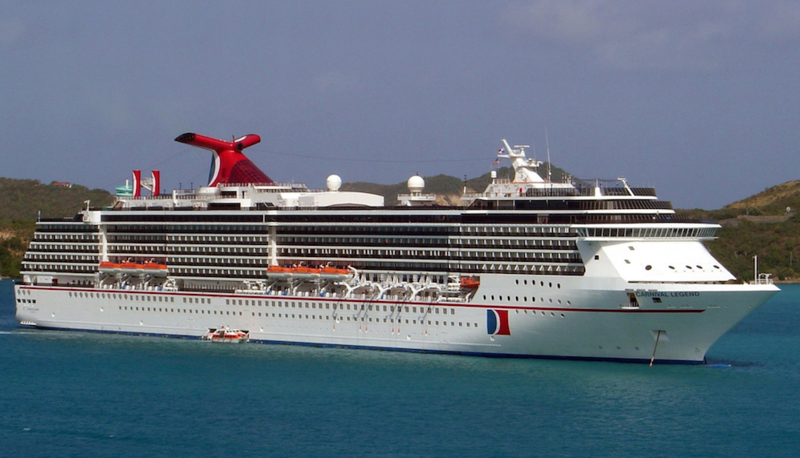 The data will be used to evaluate shark health and behavioral patterns. Save Our Seas Foundation visually documented the sampling process both on the boat and in the water. 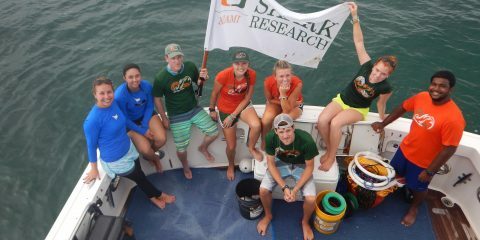 In April of 2016, SeaKeepers worked with UM Shark Research and Fleet Miami to give filmmakers from the organization Youth Making Ripples a shark research experience. 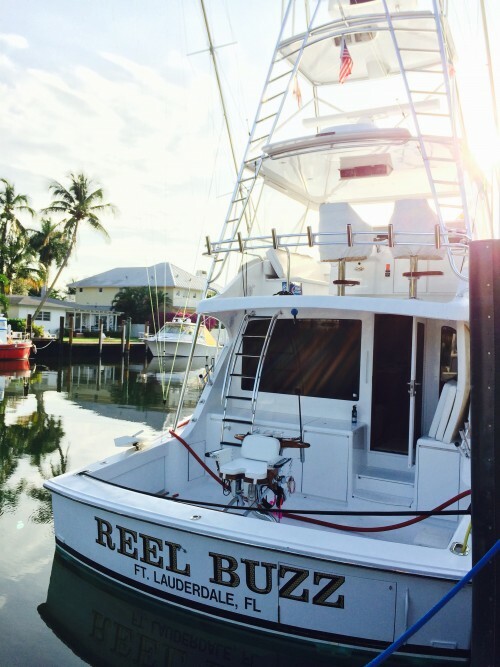 Onboard D/Y Shredder, six youth filmmakers, ranging in age from 13 to 16, along with 2 of the organization’s founders and six UM researchers spent the day tagging sharks outside of Haulover Inlet. Over five hours, we deployed 22 drum lines and caught 8 sharks – 5 Sandbar Sharks, 2 Great Hammerheads and 1 Scalloped Hammerhead. 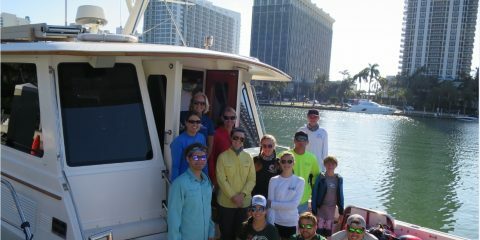 Everyone participated and helped with taking fin clips, tagging, making measurements and assessing overall shark health. 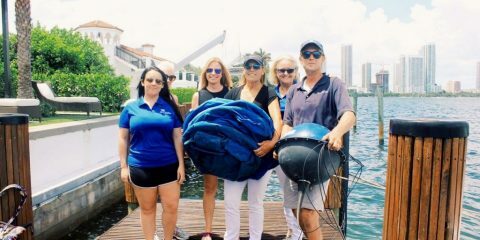 Once a month, SeaKeepers volunteers to collect and process water samples for a water quality monitoring program called Biscayne Bay Water Watch, of Florida SeaGrant. 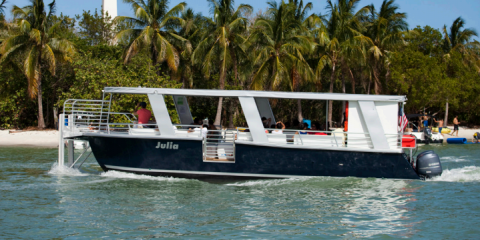 The sites we sponsor are located just out of Coconut Grove and the type of water quality measurements we collect include temperature, pH, salinity, dissolved oxygen, nutrients, and chlorophyll a. Long-term monitoring is important for the health of Biscayne Bay because it creates a baseline to measure changes in water quality that may cause harmful algal blooms, which can deplete oxygen and lead to fish die-offs. 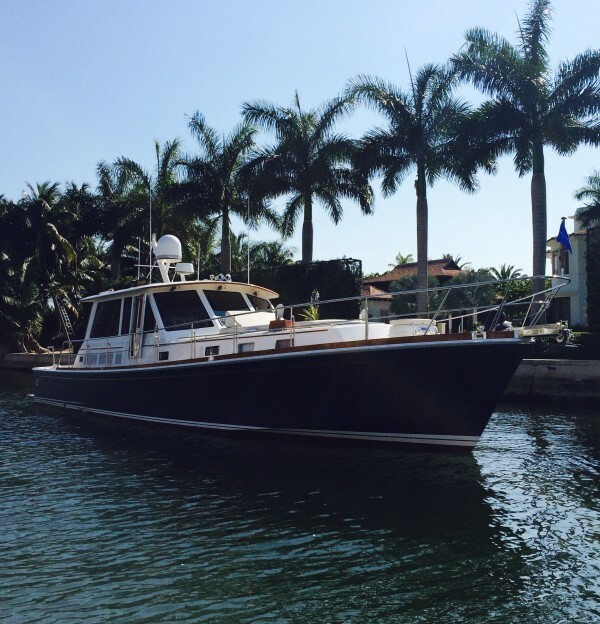 Thank you to Dr. Martin Arostegui and the D/Y Timely Sale for providing support! 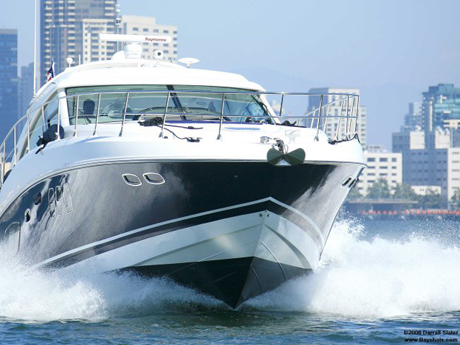 Valkyrie was the first vessel to release a SeaKeepers’ drifter. 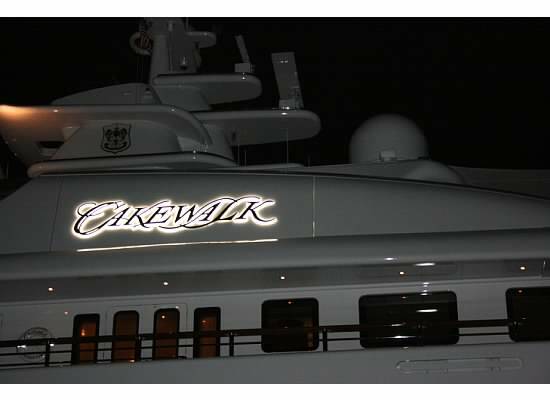 Click “more information” to see photos! 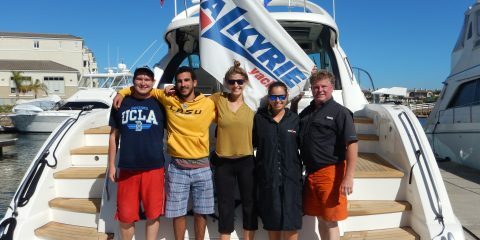 SeaKeepers partnered with scientists from the Barber Lab of UCLA to study environmental DNA (eDNA). Researchers collected water samples along the coasts of Anacapa and Santa Cruz. 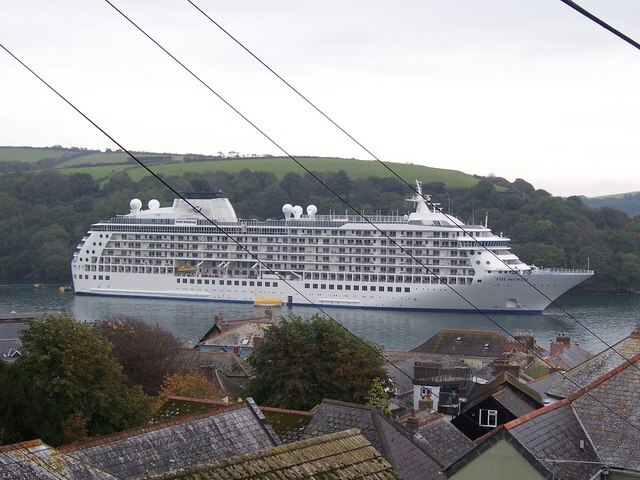 The samples were then filtered and taken back to the lab where DNA analyses could determine marine species that had recently been in the area, providing important data about the abundance and biodiversity of local organisms. The research was supported in part by a grant from the National Geographic Society Committee for Research and Exploration. 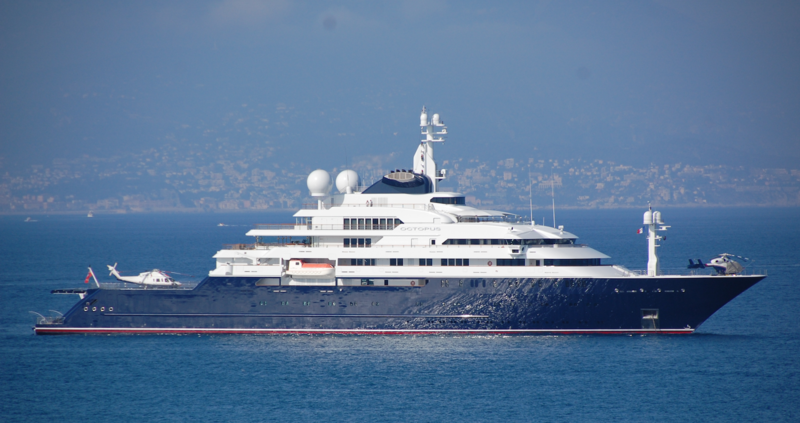 The International SeaKeepers Society worked with the United States Geological Survey to study coral bioerosion on Vigilante. 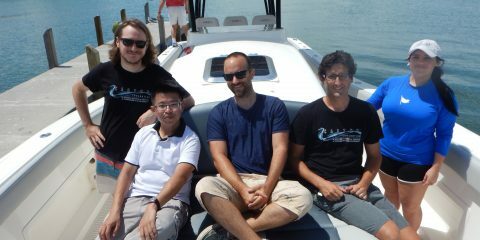 During the expedition, researchers dived several reefs off Islamorada, FL. Specific coral heads that had been previously measured more than 10 years ago were revisited. At each site scientists measured the change in height of the dead coral heads and used this to calculate the amount of erosion occurring on these reefs. Currently the causes for erosion are not fully known. Hypotheses include fish feeding, increased sedimentation and turbidity on the reef, and tourism activities. 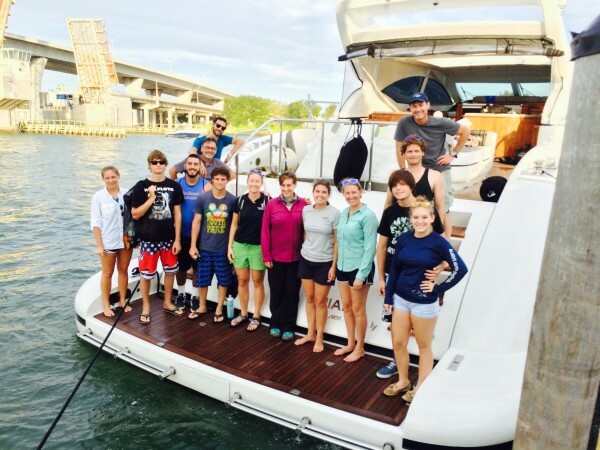 December 2015- Onboard the DISCOVERY Yacht Vigilante, The International SeaKeepers Society partnered with researchers from the Whitney Laboratory for Marine Bioscience at the University of Florida (UF). The purpose of the event was to give MacArthur Beach State Park educators, a hands-on day of collecting and studying planktonic organisms in West Palm Beach. 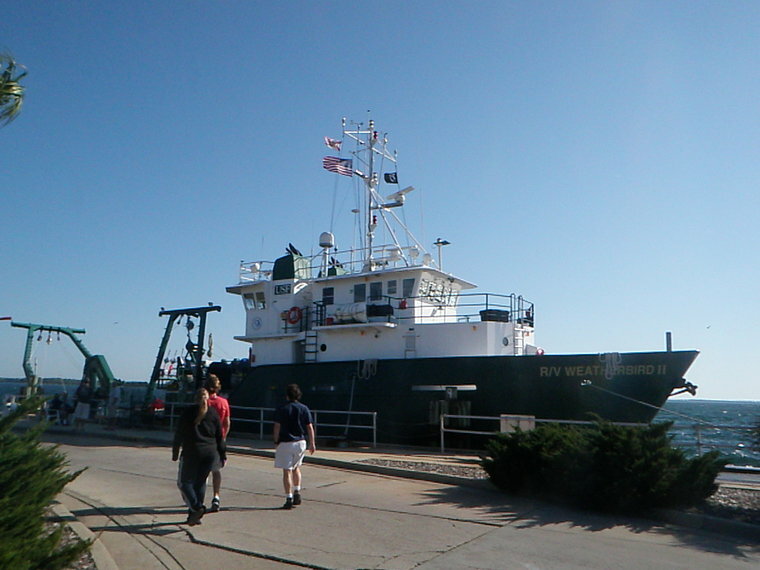 This research vessel is run out of the University of South Florida in St. Petersburg, FL.